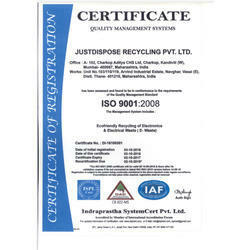 Establishes in 2009, Just Dispose Recycling Private Limited, is known for trading and wholesaling of Computer DVD Writer, Computer Motherboard, etc. To understand the precise needs of our customers, we follow customer centric approach while interacting with our customers. Checked on various quality assurance procedures, these products are available with us at reasonable prices. Known for his excellent management skills, Hemant Panchal (Director) has helped us in attaining a new horizon in this domain.